Tea capsulesThere are 31 products. With the compatible capsules Capsul' in, Ne-Cap, Coffeeduck and Nexpod you can also be made a tea via your barkeeper(coffeepot) Nespresso. 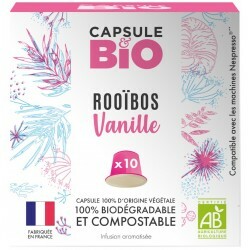 Capsules-compatibles.com selected you a range of tea allowing you to take advantage completely of your empty compatible capsules.